“Why I Disagree With My Dad,” the latest cover of Us Weekly announces in bold, yellow letters beneath a wire photograph of Ivanka Trump. The cover, which promises that “Ivanka takes a stand,” is an oversell of the story inside of the magazine. Instead of a profile of the White House aide/daughter of the President, Us Weekly has a half-hearted write-around that rehashes some of Ivanka’s favorite talking points about herself. Ivanka and her husband Jared Kushner have sold themselves as the young, fresh voices in the White House, concerned with climate change, human trafficking, parental leave, and women’s economic empowerment. Though Ivanka seems to have little to no influence on her father’s decision making, Us Weekly reassures us in their typically chirpy tone (the President is “Donald” and Ivanka is described as a “polished business exec”) that she is “still the best woman for the job.” “She’s the person he listens to more than anyone,” an “Ivanka friend” tells the magazine. It’s not clear what Ivanka is taking a stand on or what exactly she disagrees with her father about. It doesn’t actually seem to matter whether or not Donald Trump listens to Ivanka. Those details, though ostensibly pertinent, are unnecessary to the soft-focus, image-friendly narrative that’s coalesced around Ivanka. What matters is simply the repetition of that narrative: Ivanka, always more cover-ready than her brothers and slightly savvier, is the Trump family’s representation of itself to the public. Ivanka, the “onetime Seventeen cover model-turned-real estate executive,” stays digestible if she maintains the pose of independence. As long as Ivanka repeats her importance—publicly insists that her father listens—then eager outlets will always be ready to report on the father-daughter dynamic. 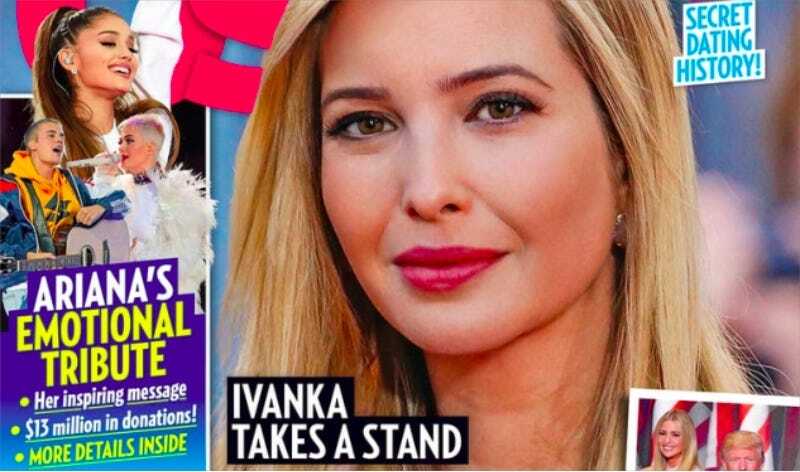 Us Weekly—now owned by American Media, the same company that owns the National Enquirer, a company whose chief executive is “very close” with Donald Trump—is more than willing to do that work; willing, at least, to invest in the continued rehabilitation of Ivanka Trump to maintain the pretense that she is relatable among her increasingly ridiculous and disliked family. As my colleague Bobby Finger noted in March, even before Us Weekly’s acquisition, the magazine “spent the past several months filling its covers with images and stories that are sympathetic—if not downright in love with—President Donald Trump and his family.” This latest cover isn’t exactly new territory for them. [...] Progressives who hoped that Ivanka Trump and Kushner’s presence in Trump’s inner circle would moderate the president’s most extreme stances said they saw Thursday’s exit from the climate accord as another demoralizing moment. Politico’s piece is thematically similar to Us Weekly’s, forgiving of her failure but persistent in the claim that Ivanka is trying to persuade her unpredictable father (if she is, not even Ivanka will admit to it). Ivanka is the calm to her father’s storm; the only woman who can possibly tame such a blustery presence of a man. None of this strikes as true, these tropes are too familiar and too fictional to have any grounding in reality. And yet, it’s repeated with such regularity that it’s become true enough—a method typical enough of the Trump family that, by now at least, it should be transparent.